You'll want to be kicking yourself if you missed the MotoGP race on Sunday. It was one of the best of the season, even though Marc Marquez won, again. It was action packed from the start with Lorenzo going around the outside of Pedrosa on the first corner with Rossi and Marquez in hot pursuit. Then the top four headed off into the distance leaving the rest behind with just Stefan Bradl hanging onto the coat tails of the factory bikes. Rossi took the lead on lap four to gracious applause from the crowd and stayed in the lead till the 19th lap with Marquez and Pedrosa hot on his tail while his Yamaha teammate Lorenzo dropped back a bit. After a few attempts at the lead Marquez finally made a pass on Rossi on lap 19 that stuck. 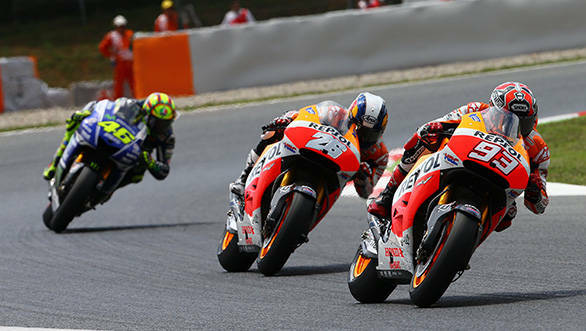 Pedrosa also managed to pass Rossi on lap 23 and then started harrowing his team mate for the lead. Pedrosa managed a number of passes down the inside of his teammate but ran wide each time letting Marquez back into the lead. This continued till the last lap when Pedrosa closed up on Marquez on turn 11. So close that they touched and Pedrosa almost went down. This incident was enough to allow Rossi back into second place and this is how he crossed the line. Lorenzo finished in fourth, having kept within sight of the battling trio but never really close enough to get involved in the action. Marquez's win now takes his winning streak to seven races for 2014 with the next race in Assen in two weeks time. The action has closed up over the last few races and it's getting harder and harder for Marquez to break away from the pack. Last time around Lorenzo took the fight to the championship leader and this time around it was Rossi and his own teammate Pedrosa who made him work extremely hard for the win. No matter who comes out on top next time, even if the racing is half as exciting as this one was then we're in for another cracker. Steve Rabat managed to extend his lead in the championship with victory in Catalunya. After initially battling with Maverick Vinales he pulled out an impressive 4s lead over the Spaniard to take his fourth win of the season. Vinales too rode a lone race in second, a good seven seconds clear of the intense third place battle between Tom Luthi, Mika Kallio and Johann Zarco. In the last lap a great passing maneuver saw Zarco seal third spot on the podium, passing both Luthi and Kallio in one move. Marquez's brother brought home his Honda a fantastic 3.2s ahead of the chasing pack in the Moto3 race. This was remarkable for three reasons. Firstly it's the first time that two brothers have won a race in GP racing sine its inception. Secondly its it first win for Honda in the Moto3 category since the 2012 season and lastly leading from start to finish and gapping the chasing pack by over three seconds become increasingly rare in Moto3. He did have to thank the chasing pack of nine riders who were busy tripping over each other allowing him to make a brake. Rookie Enea Bastianini won the battle of the rest finishing just ahead of Efren Vazques who took the last step on the podium.